With the revelation about PRISM (NSA's surveillance program), there has been a lot of talk about the protection and security of the communications that you make online. Services like Gmail are no longer safe for communicating important peices of information and people are becoming more and more cautious about security of private data. 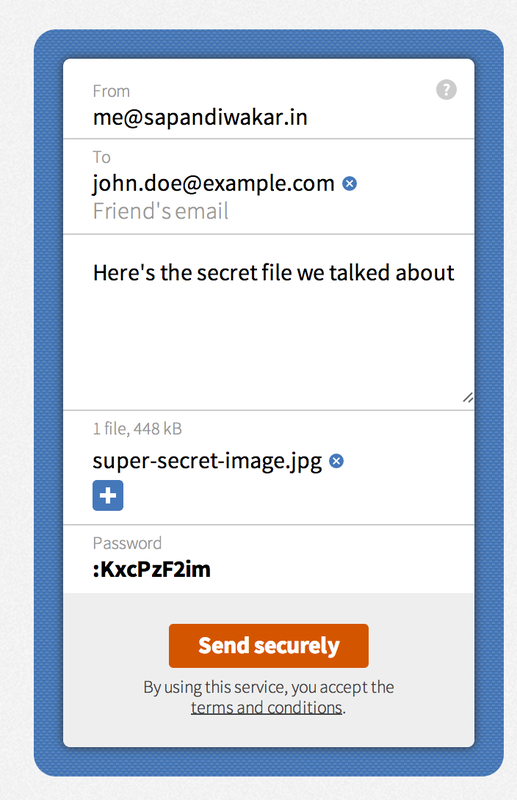 With this in mind, my friends just launched makesends.com, a service to transfer files securely. It uses end-to-end encryption to protect the files. All files are encrypted inside your browser before they leave your computer, and decrypted only on the computer of the receiver. Files are never decrypted along this path, leaving no possibility for hackers or surveillance agencies to obtain a copy of your original file. You can view the security policy in detail here. The interface is really simple. Just upload your files, fill the email addresses and choose a password. It even fills in a secure random password for you to begin with. It currently has no limit on the file sizes and you can send files upto several GBs in size. Have any questions? Visit FAQ.